Ramblings from an Over-Squozen Brain: Carols & Communion by Candlelight! Carols & Communion by Candlelight! I'm SUPER excited about our Christmas Eve service at 5:00PM on Wednesday. 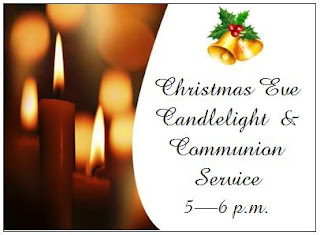 "Carols and Communion by Candlelight" will be a great experience to everyone who comes, and YOU'RE invited! We've got several folks who will be participating in leading various carols and we'll celebrate communion together, all in an atmosphere of worship and simplicity. I'm excited about the wide participation from several folks who will each add a special touch. And the candlelight portion of the service is always special and creates wonderful memories! All of this and we'll have you out by 6:00PM so you can enjoy the evening with your family. I'm really looking forward to spending part of our Christmas Eve with YOU! I know you're looking for an update on my mom and I don't have a lot to report, other than she's doing better every day. Today was better than yesterday and tomorrow will be better than today! They did find a blood clot on her lung, which explains why she was struggling with getting her blood-oxygen levels up. They've got her on some additional blood thinners that should help with the clot. She'll feel so much better when she's not out of breath! See you at our Christmas Eve service! Momma's home!!! And a Very Merry Christmas! Moving on up ... for real!!! Last day in Mexico - and home, sweet, home! Overwhelmed - and Wore Out! But beyond happy!